Pictured (l-r) at the Irish Auto Trade Awards were Jackie McNamara, Cawley Auto Repairs, Sean Gallagher (master of ceremonies), and Michael Cawley from Cawley Auto Repairs accepting their award for Connacht/Ulster Independent Workshop of the Year 2015. Cawley Auto Repairs is situated on the Breaffy Road in Castlebar and specialises in Mercedes and also carries out extensive work on Volkswagen and Audi. Founded by Michael Cawley in 2010, the company has been to the fore in car servicing and repair in the west of Ireland ever since and is a member of the Society of the Irish Motor Industry. From the initial stages to becoming one of the most established centres it has ensured to attain its ultimate goal which is providing an excellent service to its valued customers. Cawley Auto Repair has just been confirmed as joint winner of the Connacht-Ulster Independent Workshop of the year 2015. These are inaugural awards in recognition of the importance of the auto after-market in Ireland. 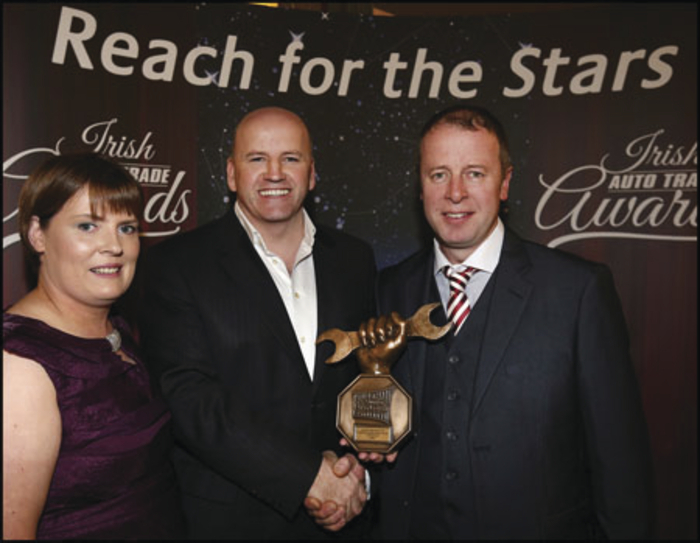 The company was presented with the award at a gala event after a specialised auto trade expo in the Citywest Hotel last Sunday. Michael Cawley and all at Cawley Auto Repairs are delighted with this award and look at it as true recognition and acknowledgement of the personal and dedicated service they provide to all their customers. Cawley Auto Repair employs highly qualified staff including a Mercedes-Benz diagnostic technician; it uses the star diagnosis system, a tool that allows the technicians to access the essential systems in a car with the aid of a computer. They pride themselves in using original parts and good quality after-market parts believing that it is imperative to maintain a car well, ensuring the longevity of the vehicle.